Growing up I was always encouraged to keep my hands and mind busy. 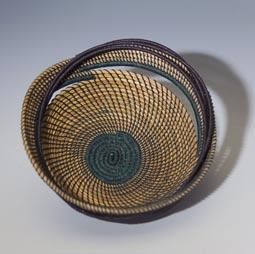 So, it is no wonder that I fell in love with basketry. When I learned to make traditional coiled pine needle baskets a door opened to a vast arena of creativity. From there I began to explore the use of color, shape, positive and negative space. With each of my coiled pine needle baskets I try to push my personal limits, some with pleasantly unexpected results. Recently through an artist from Southern California, I discovered the technique of knotting, and another door opened. The use of a simple form onto which a knotted fabric can be woven has inspired me yet again. This time, the options of how I conceive a basket or vessel are limitless. I can completely enclose a form in the knotted fabric, I can create a bowl like depression, or I can allow the woven material to come up and then collapse upon itself. There is no end to the possibilities. Born and raised in Reno, Nevada, Gretchen received a degree in English Literature from San Francisco State University. She makes her living as a technical writer, translating complex technical concepts into easily understandable terms. Her art helps create a balance with the left and right sides of her brain. Currently a resident of Reno, Gretchen lives with her two dogs, Annabelle and William, and Buddy “the fat cat” who allows them to share his space.